North of Bologna, the Reno River divides the twin towns of Cento and Pieve di Cento. A role as a border town established since the Middle Ages made this a double settlement; even today Cento is in Ferrara province, Pieve di Cento in Bologna’s. Cento is largely creation of the medieval Bishops of Bologna, who oversaw the draining and settling of the land. To protect it they built the 14th-century Rocca di Cento, which is now used for exhibitions and concerts in season. In 1502 Pope Alexander VI included the town in the dowry of his daughter, Lucrezia Borgia, when she married Duke Alfonso of Ferrara. 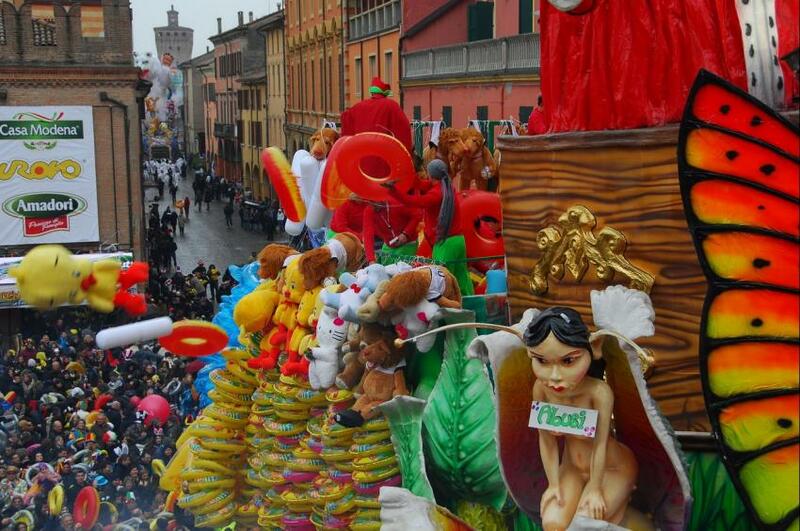 Today Cento is probably most famous for its Carnival, where the streets fill with impressive floats and costumes on the four Sundays before Lent. Few towns its size in Italy put on such a good show. Cento was the birthplace in 1591 of the painter Giovanni Francesco Barbieri, better known as Il Guercino (‘the squinter’), some of whose work is in the Pinacoteca Civica Il Guercino in the 18th-century Palazzo del Monte di Pietà, Via G. Matteotti 16. This museum also contains paintings by other Bolognese artists, including one of the most acclaimed works of Ludovico Carracci, the Holy Family with St Francis. Unfortunately, much of Cento was damaged in the 2012 earthquake, including this museum, which is still closed for restoration. In the meantime, his works have been moved into the newly-opened Pinacoteca San Lorenzo, in the church of San Lorenzo (see practical info below). Getting to Cento: Take Bus No 97 from Bologna Bus Station; the journey takes about 50 minutes.